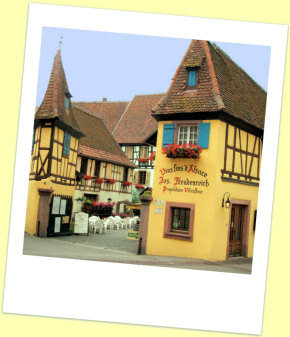 No, before you ask, I’m not a secret agent for the Alsace tourism authority. This encomium is prompted by the undiminished delight resulting from my recent, third, stay in Eguisheim. It seems selfish not to share it as an ideal holiday destination for wine enthusiasts. A few heart-warming statistics will help to back my claim. Eguisheim is in the best wine area of Alsace, the Haut Rhin, very close to Colmar, and has a permanent population of fewer than 2000 people. There are 35 wine producers in the village itself (or 40 depending who you speak to, with many more within easy reach) and around a dozen restaurants. Although Riquewihr is the best-known and most-visited wine village in Alsace, to me Eguisheim is both more attractive and more enjoyable to stay in. Rarely is it oppressively packed with tourists, unlike Riquewihr. The circular construction of the walled mediaeval village is still evident in the narrow, curving streets of impossibly picturesque houses with steep roofs and brightly coloured walls festooned with flowering plants. 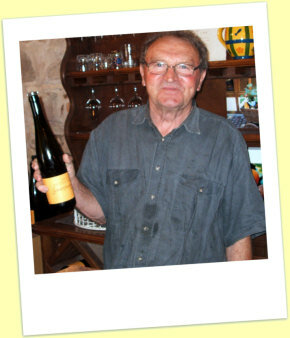 A stroll up the Grand’Rue will take you past one wine producer after another, starting at the bottom with Leon Beyer. Here there is none of the uncertainty about the style of the wines resulting from the tendency towards higher residual sugar in recent years. Beyer’s wines are unfailingly dry, even austere, and benefit from several years ageing. A few steps further up the street (not unsteady ones, of course, because the typically large selection of wines at each place means that it is prudent to spit) are the spacious premises of Wolfberger, the Eguisheim cave co-operative. Alsace is blessed in the quality of it co-operatives, with the wines of the CVs at Turckheim, Ribeauvillé, Hunawihr, and others, being familiar in UK stores. Wolfberger, despite its 480 members and huge production is one of the best, and its tasting room provides access to its seemingly endless range. Progressing (weaving?) further up the street, you can’t fail to see the statue of Eguisheim’s most famous son, Pope Leo IX, standing in front of his family’s former home, the Chateau d’Eguisheim. While we’re indulging in the cult of celebrity, it’s a short distance further to rue Monseigneur Stumpf, named after a former Bishop of Strasbourg. For wine lovers it is more significant as the location of a great favourite of many Wine Forum contributors: Bruno Sorg. Tom Stevenson, in his superb but now fairly elderly guide to Alsace wines, says of Sorg, “Either he is a natural genius or he accidentally makes classic wines from virtually every variety in all vintages”. His son is now the winemaker but clearly a long apprenticeship has maintained the same style and quality. The amazing thing is that, although the wines are outstanding, the prices are modest, no more than those of the cave co-operative. The wide appeal was obvious on my last visit. A group of eight Swedish cyclists arrived and were cheerfully provided with eight tasting glasses. An English family were on a return visit to buy some Grand Cru Pfersigberg Muscat (“The best Muscat I’ve ever tasted”). Sold out, alas. An elderly German couple sat at a table helping themselves (“We’ve been coming here for 30 years”). The old man insisted that I try the Vendange Tardive Pinot Gris they were tasting. I wasn’t planning on buying any VT, but this was nectar. Irresistible! There are so many other producers, some possibly familiar though UK outlets, such as Paul Ginglinger and Charles Baur, and many more which are not. The variation in house style soon becomes apparent, as does the marked vintage variations. A brief word about considerate behaviour. Standard advice to the wine tourist is that it’s best to phone small producers in advance. The problem is that the person at the other end of the line frequently departs from your carefully prepared script in the first few seconds, leaving the inexpert French speaker floundering. There’s no such problem here. Most producers have signs out to say that they’re open for tastings. If there’s no-one about, just go in and ring the bell. Despite all these virtues there is a snag, of course. Dedicated red wine drinkers are not so well catered for. Traditionally Alsace Pinot Noir has been little more than rosé. This style is still produced but over the past 15 years or so wine makers have been increasingly using Burgundy as the model, with more serious reds aged in barriques. Some of these wines are still very lightweight and not very age-worthy; others are more impressive and can develop over 10 to 15 years. Lots more tasting is obviously called for. And what better opportunity than the various wine festivals? July is the best month. This year a “Week of Wines” begins on 17th July, continuing with a “Night of Grand Crus” on the 20th, then moving a small way up the road to Wettolsheim on the 21st and 22nd. The format is the common one of buying your glass and then tasting from the wide range available. At the end of August there is Eguisheim’s “Fete des Vignerons”, with parades, music and food served at the winemakers premises. Great fun. Although there are plenty of restaurants in the village, the quality isn’t quite as great as with the wines. 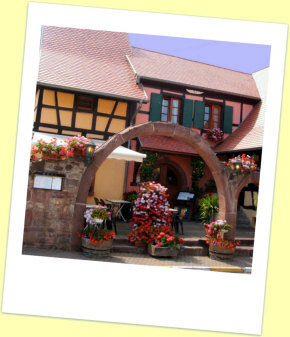 The Michelin starred Caveaux d’Eguisheim has now closed, and the remainding restaurants offer traditional Alsacienne dishes. This can have its negative side: do you enjoy choucroute (sauerkraut)? I don’t, and it is ubiquitous. On the other hand there is superb onion tart (especially at La Terrace Gourmand, also renowned for its foie gras) and flavoursome poulet au Riesling. The cheap and cheerful Auberge du Rempart, with tables in the picturesque courtyard behind the ancient fountain on the Grand’Rue, is great value. It is owned by Leon Sorg, whose restaurant wines are from his own vineyard; not up to the standard of cousin Bruno’s, but modestly priced. The Auberge Alsacienne has surprisingly good cuisine. Other worthwhile choices are La Grangelière and Au Vieux Porsche (pictured), the latter owned by the Paul Zinck family. It has an attractive setting, welcoming staff, and offers wines from other producers as well as their own. All this eating and drinking can be virtuously counterbalanced by walking. The backdrop to Eguisheim is a range of striking hills. The lower slopes are covered in vines and include the two grand cru vineyards, Eichberg and Pfersigberg. There are numerous tracks through the vineyards, many with large signs giving information about the vineyards and the vines. They provide an opportunity for fairly easy walking. Steeper paths lead through the woodlands of the upper slopes to the ruined towers known as Les Trois Chateau. On the next hilltop is the restored Hohlandsbourg castle, with various touristic attractions. The vineyard walks can take you to the next wine village of Husseren-les-Chateaux, with another clutch of wine producers, including Kuentz-Bas. A shorter path in the opposite direction leads to Wettolsheim, with more vignerons. Familiar names here will be Albert Mann and the biodynamic Barmès-Bucher. (Sadly M. Barmès died in a road accident last November.) And I haven’t mentioned the storks. There is a stork refuge on the edge of the village where parents, with their characteristic bill-clattering and displays with backward-thrown heads, and their chicks can be seen. There are also storks’ nests on several of the highest rooftops. A walk down the main street is often enlivened by the sight of one of the birds, wings like trestle table tops, heads like spears, long legs trailing, using the Grand’Rue as its flight path. There’s no real need to leave Eguisheim in a week’s stay, but if the temptation to visit other wine producers is strong there are around 20 other wine villages within about 30 minutes’ drive, plus Colmar, with its art galleries and restaurants, on the doorstep. Not to mention the pleasure of other walks, such as that between Zellenberg, Hunawihr and Riquewihr, each one packed with vignerons. Additionally it’s only about 40 minutes drive to the vineyards of the Kayserstuhl in Baden, just across the Rhine. I don’t know if I’ve convinced anyone, but after reading through this I can’t wait to get back!